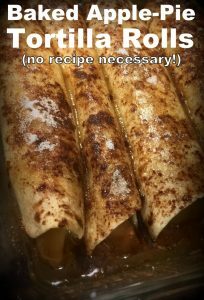 Quick Baked Apple Pie Tortilla Rolls - No Recipe Needed! Although almost most of our meals are cooked from scratch. Sometimes off-the-homestead commitments results in me being unprepared for supper. But in all honesty since I use the cook-once, eat-twice method of cooking, I almost always have a main dish in the freezer for such occasions. So I served thick charcoal-grilled ham slices, steamed carrots with butter & fresh rosemary and a serving of coleslaw. The grilled ham slices were simply pulled from the freezer & the steamed carrots were remaining from yesterday’s meal and the coleslaw was in the fridge. So a delicious homemade supper was on the table in a flash. But when I take so many shortcuts for one meal I typically try to make a dessert for that handsome man of mine to make up for the meager offerings. It doesn’t help to make a quick supper if dessert takes lots of time. I still needed a quick dessert option. 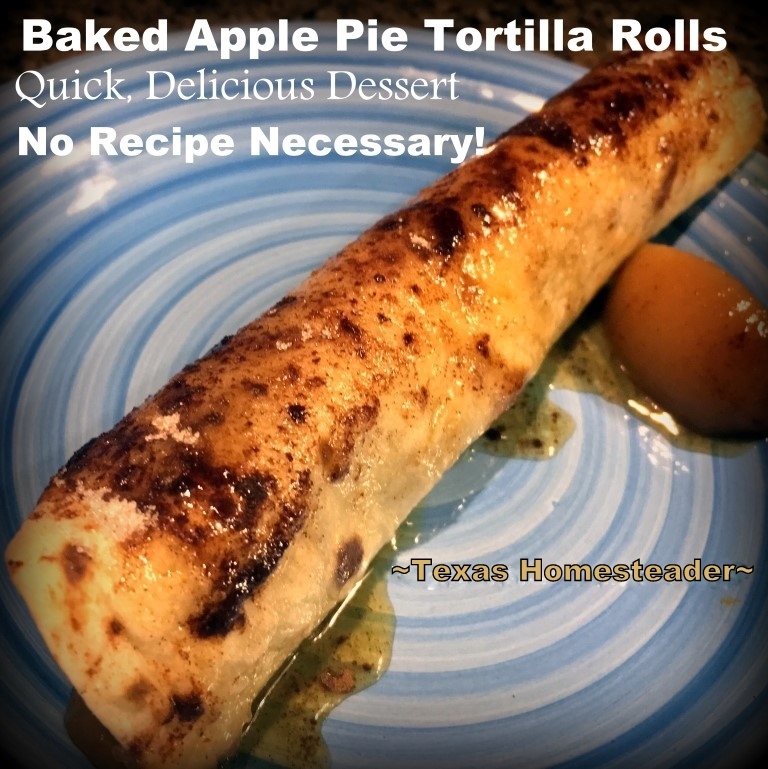 Hey, I know, I’ll use some homemade apple pie filling & a few tortillas to make baked apple pie tortilla rolls! Baked Apple Pie Tortilla Rolls – No Recipe Needed! Here’s the most beautiful part – there’s really no recipe to follow! The short version: roll apple pie filling into flour tortillas, drizzle melted butter, sprinkle cinnamon & sugar & bake for about 15-20 minutes. Yep, it’s really that easy. But here are more specifics. First preheated the oven to 350 degrees Fahrenheit. I pulled out a jar of my homemade apple pie filling & lightly heated a few tortillas to make them smoother to roll. Then I spooned apple pie filling onto the edge of the tortillas & rolled them up. They were laid in a small baking pan seam-side down and sprinkled with cinnamon/sugar. Then I poured melted butter all over them and baked them uncovered for 15 minutes. (well, best I could – my oven is glitchy & keeps turning itself off & on…)You can cover them to keep them soft, but I wanted a little texture to the tortillas. So I left mine uncovered. They were really good though. A good, quick, delicious spur-of-the-moment dessert with no recipe needed. I think they would be even more delicious and certainly company-worth with an added dollop of cool whip or Homemade Whipped Cream. This entry was posted in Blog Posts and tagged Cooking, Fall, Frugality, Recipes on October 29, 2017 by Texas Homesteader. Love how simple this is. Will have to give it a try. My grandkids are going to LOOOOVE to make these…..I am going to LOOOOOVE to eat them….LOL!!! I wonder if you could use canned cherry pie filling? I have that on my pantry shelf. If I try it, I’ll let you know. You do have great ideas. I still like the idea of being your neighbor for sampling your leftover goodies. Oh no I forgot you live in Texas. I tried that once!!! Doing this today. Thanks, you always have such great ideas. This is going to happen today! Regards BTW. 31 here this morning.